Set in a futuristic utopia, an elite peacekeeping force thwarts the rumblings of civil war. But deception within the ranks has caused two members of the most feared unit to strike out on their own. Now stranded on an abandoned paradise, Grayson Hunt and Ishi Sato find themselves surrounded by hordes of mutants and flesh eating gangs. They survive on two objectives: get off the planet alive and extract revenge on the man who sent them there. 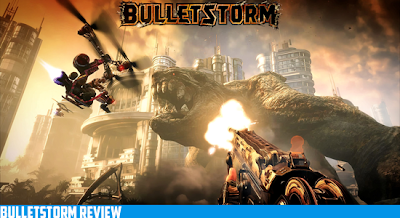 As Grayson Hunt, players wield an arsenal of over-the-top combat moves and outrageously large guns that feed into Bulletstorm's distinct skillshot system producing unprecedented levels of frantic gameplay and yell-inducing satisfaction. Bulletstorm is a vulgar masterpiece, and regardless of the many issues it is sure to find its way into your consoles or pc. It takes killing to a beautiful art giving you the ability to finish off your opponents as you see fit. There are plenty of stunning environmental hazards to increase your kill score, and your killing arsenal is just as expansive. 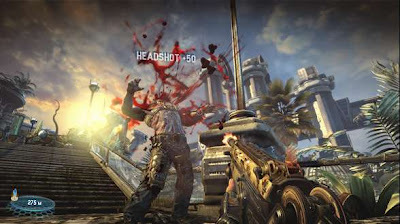 There is no comparison between Bulletstorm and Black Ops, because they follow two different FPS formulas. However those that want a serious story would probably wish to seek out Call of Duty, simply because the story of Bulletstorm is less than impressive. The beauty of this shooter cannot cover up some gruesome flaws that the game chose to ignore. One of the biggest issues is the lack of actual game to play, with a very shallow multiplayer and a roughly 5 hour campaign. I have played games longer on an old school arcade machine; also there is little reason to continue playing Bulletstorm other than to improve your overall score. In my opinion the campaign would have been more tolerable if it wasn't for the ridiculously terrible jokes and constant unnecessary swearing. Another key issue is the whole draw of the game is to “kill with skill”, but in multiplayer getting overzealous with killing will actually decrease your teams overall score. The only real glimmer of hope is that they release tons of DLC to keep players interested. 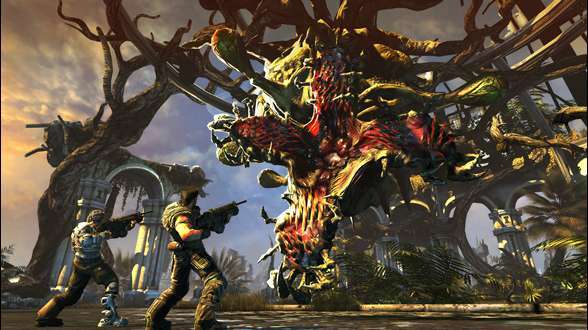 While Bulletstorm is a great game, with a unique take on FPS games it just falls short of what they promised us. Much like the main character of the game, they got overly cocky and ended up in a terrible situation. Many will still buy this game, but a month from now those exact people will be going right back to Call of Duty, simply because there is no substance. I would suggest waiting until the price is dropped dramatically before considering the purchase.